A man who can erupt in flames and fly through the streets of New York. An alien who crash-lands in a Midwestern farm as a baby. A Cairo street urchin worshipped as a goddess for her ability to manipulate the elements.More than any other modern story-telling medium, tales of superheroes require a constant suspension of disbelief. Knowing this, their creators often imbue these fantastical characters with humanity, emotion and purpose, in an attempt to make them not only believable, but also relatable. Peter Parker is a teenager dealing with the struggles of adolescence while coming to terms with the responsibilities of “great power.” The mutants of The X-Men are faced with prejudice, discrimination and threats of destruction by the very Homo sapiens many of them choose to protect. Bruce Banner, a brilliant scientist, must learn how properly to temper his emotions, and the monster stress brings out in him, in order to keep himself from becoming “the living engine of destruction” known as the Hulk. In these stories we see extraordinary characters faced with incredible circumstances as they try to navigate through universal struggles. This is why we continue to follow their long, winding stories, no matter how unbelievable or ridiculous they may become. Created in 1941, Wonder Woman, a demigoddess Amazonian warrior princess, was originally envisioned as “psychological propaganda for the new type of woman who…should rule the world.” She was the pin-up who left you “both frightened and aroused” as she took on Greek gods and German generals while invoking “all 12 volumes of Cleo’s treatises on body and pleasure.” But the new Wonder Woman film, starring Gal Gadot, requires a level of cognitive dissonance that may be far too great to overcome. 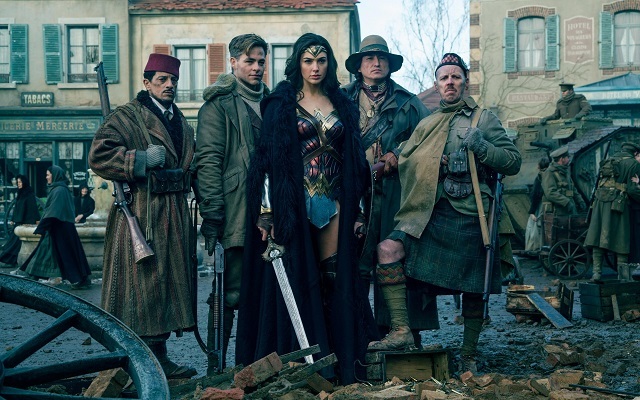 As an entry into the much-maligned DC Comics’ cinematic universe, Patty Jenkins’ film about Diana, the best fighter among a tribe of warrior women living on an island paradise, who are forced to confront the realities of World War I-era Europe, is a noble effort. Indeed, it may very well be the best film in the D.C. canon since 2005’s Batman Begins. More than 76 years since her introduction, Wonder Woman has become an iconic character, whose powers and origin are known by even the most passive of superhero fans. We are all familiar now with Diana Prince’s lasso of truth, bullet-proof Bracelets of Submission and her days as the Princess of Themyscira. What is too difficult to overcome, the real challenge to the film’s believability is lead actress Gal Gadot. This has nothing to do with fanboys angered by the casting of a Jewish woman to play an Amazon, or complaining that herfigure fails to live up to the character’s “Amazonian” proportions. The disappointment of Gadot’s casting lies not in her physical appearance but in her politics. Like Superman and Captain America before her, Wonder Woman —both as Diana, the Amazon princess, and as Diana Prince, modernity’s New Woman — has always been a politicized character. Whether embodying a twentieth century feminist ideal on the cover of the inaugural issue of Ms Magazine, or as a Hellenic fighter of fascism in the pages of one of the world’s most famous comic book franchises, Wonder Woman was always used as a symbol for something larger than herself. However, it seems what the Wonder Woman of the new world, as portrayed by Gadot, represents is an odd paradox and a sad irony. Both of which make believing in her as a defender of justice and truth too difficult to accept. As an Amazon, Diana is sworn to fight for and defend “all that is good in the world,” and yet Gadot, a 32-year-old Israeli is a noted supporter of the Israeli Defense Forces. In 2014, Gadot expressed her support of the IDF during their shelling and airstrikes of the Gaza Strip, which led to the deaths of at least 2,200 Palestinians, most of whom were civilians. Gadot herself served in the IDF for two years as a combat trainer. Gadot’s support of Israel and its aggression against occupied Palestine brought a profound level of cognitive dissonance to her portrayal of Diana Prince, who is shocked at the brutality of the so-called “war to end all wars.” Every time Gadot’s Wonder Woman expresses her confusion and dismay at the cruelty of war, one can’t help but think of the 500,000 people left displaced by the 2014 Israeli incursion into Gaza or the impact of the decade-long economic blockade that has led to a 68 percent youth unemployment rate in the strip. When Wonder Woman speaks in horror of the Germans using weapons “against people they cannot see”, one wonders whether Gadot, when uttering those lines for the cameras, ever once found herself reminded of the impact of the Israeli bombing campaigns she so vehemently supported, carried out by IDF pilots against “people they cannot see”. Sitting in the theatre, seeing villagers in “no man’s land” hiding behind rubble and debris, my mind flashed back to a 2012 CNN interview with Mohammed Sulaiman, a Palestinian living in Gaza, who was constantly interrupted (and abruptly cut off) by the sounds of bombs being dropped all-around him by Israeli warplanes. In another scene, Diana has a conversation with ‘The Chief’, a seemingly generic indigenous man of unclear origins, who has escaped from North America to Britain. Diana, ever the idealist, cannot understand how The Chief fights in a war in which he hasn’t taken a side. As The Chief explains that the last war his people took part in saw the white man, embodied by Chris Pine’s Captain Steve Trevor, take everything from them, Diana looks on in disbelief. Her reaction may have been less jarring, even believable, coming from another actress, but with Gadot as Wonder Woman, it takes on an especially ironic tone. Again, I was left to wonder whether Gadot could see the connection between the forceful takeover of native lands in North America and the Israeli government’s decades-long campaign of dispossessing Palestinians of their lands, including the announcement earlier this year that Israel would construct 2,500 additional settler homes in occupied Palestine. The truth is that, purely in thespian terms, the former beauty queen is a capable enough actress to play Wonder Woman, but her much-documented support of the Israeli occupation of Palestine makes it nearly impossible to divorce Diana Prince’s pro-peace idealism from Gal Gadot’s own support of Israel’s continued military occupation and violence against the Palestinian people. Gadot could have played almost any other character in the world, and it wouldn’t have been nearly as jarring as it is to see her playing a daughter of Zeus who “cannot stand-by while innocent lives are lost.” Her casting is especially troubling considering how high the commercial stakes were for Wonder Woman, the first female-led superhero film since 2005’s abysmal Elektra (starring Jennifer Garner). Luckily for the franchise, casting Gadot seems to have done little to hurt the film’s phenomenal box office returns or surprisingly positive critical reception. Indeed, these successes have led to renewed hopes Hollywood might finally embrace female superheroes, a genre that has largely been neglected by the industry, despite the recent boom of comic book franchises being made into movies.